Once upon a time, not long ago, voters actually voted with their best interests at heart. Oh sure, there were Democrats and Republicans and even some of those pesky little independents who now seem to be the pivotal block in almost every major election. Heck, some people even voted communist. But what all of the candidates had in common was intelligence. They were always smart, highly educated and experienced. All voters needed to do was choose which ones best represented their economic, social and foreign policy interests. Not today. And in particular, not in today's Republican Party. What we're witnessing today is a monumental dumbing down of GOP politics. The lowering of the standards and qualifications bar so low that only candidates appealing to the lowest common denominators stand a chance. Intelligence, education and experience is out. Ignorance, inexperience and nauseating folksiness is in. 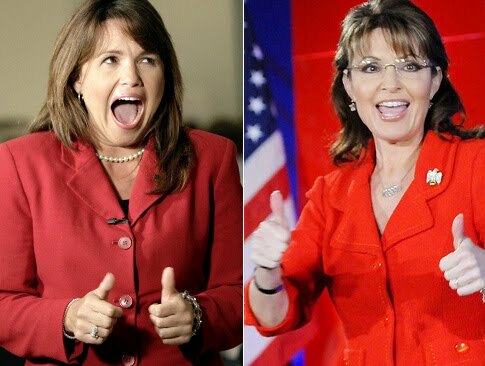 Which leads us to two seminal figures in today's GOP: Sarah Palin and Christine O'Donnell, the Tea Party queen and princess respectively, who have helped redefine grass-roots politics, and not in a good way. Palin, who helped put the Tea Party on the map, and her protegee O'Donnell, best personify the new breed of Republican: charming, attractive, angry non-intellects who mock education, science and logic, while claiming "I am you" in an effort to identify with average voters. It's Mrs. Smith Goes to Washington, except without any ideas, vision or intelligent things to say. But give them some credit. These two empty-suited frauds have accomplished the unthinkable: by historic comparison, they've actually made George W. Bush seem smart and qualified. Say what you will about old Dubya, but at least he served two full terms as Texas Governor. And, contrary to O'Donnell's proud claim for herself, he went to Yale. Stacked up against these two colossal lightweights, he's Lincoln. Now don't get me wrong. I'm not saying there's no place in Washington, no place in the GOP, for the likes of Palin and O'Donnell. But rather than be considered serious contenders for the White House and Senate, perhaps a job where their qualifications are better matched might be in running out to get Mitch McConnell's or John McCain's lunch or fetching John Boehner's martinis and tanning cream. What's happening to the GOP should be of grave concern to Republicans, who are watching their party become hijacked by the unintellectual elite. The dummies have taken over, and the old guard--McCain, McConnell, Boehner and other establishment Republican leaders--may find themselves powerless if the Tea Baggers get their way in three weeks. In today's GOP, the dumber candidates are and the more they project themselves that way, the more they think they'll identify with the common voter. Who needs experience? Who needs a solid education? Who needs to be able to stand before the press and not sound like an absolute, substance-lacking moron? If Palin, O'Donnell, Angle, Rand Paul, Joe Miller, Michelle Bachmann and others in the Tea Party Army represent the future of the Republican Party, then the Republican Party has no future. G.W. didn't finish his second term as Governor. He ran for Prez during that term and was inaugarated as prez in 2001. His gubernatorial term would aended in 2002. He left Texas with the dubious gift of Rick Perry, then Lieutenat Governor and now on the verge of winning another four years. I always get a kick out of how "stupid" Republicans beat "brilliant" Democrats. How dumb are you if you keep losing to dummies? The reason why the GOP has turned into a mob of vicious imbeciles is because the GOP has taken on the culture of low-brow, rightwing talk radio. Talk radio runs the GOP, and the country.